Buddy was interested in what Randy and I were exclaiming about! 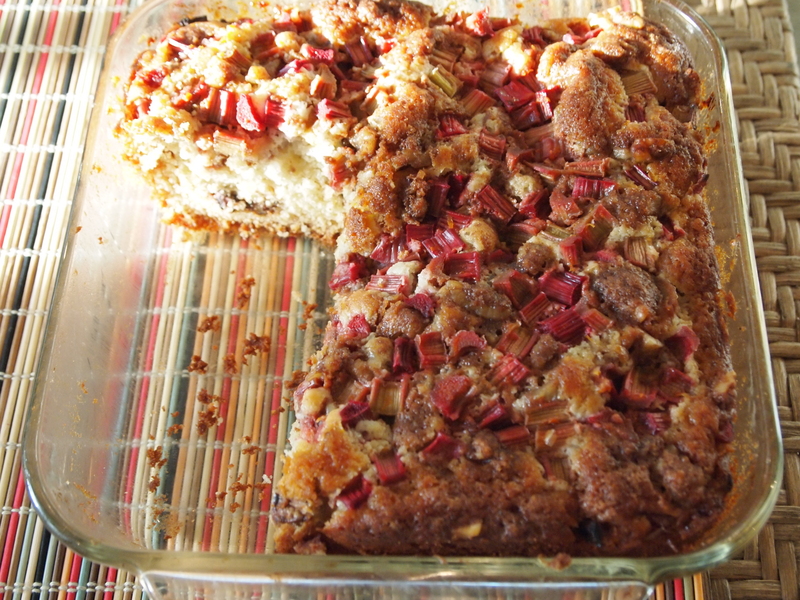 It was a new rhubarb recipe – a spin on the classic sour cream streusel coffee cake. 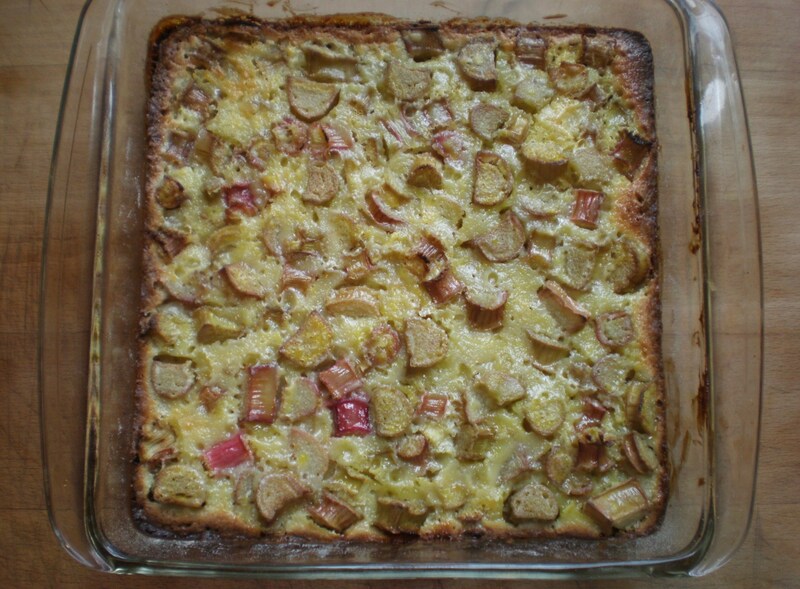 We can’t get enough rhubarb here at S&SK, so when this recipe showed up last week on Pinterest, I ran right over to my friend Dianne’s. 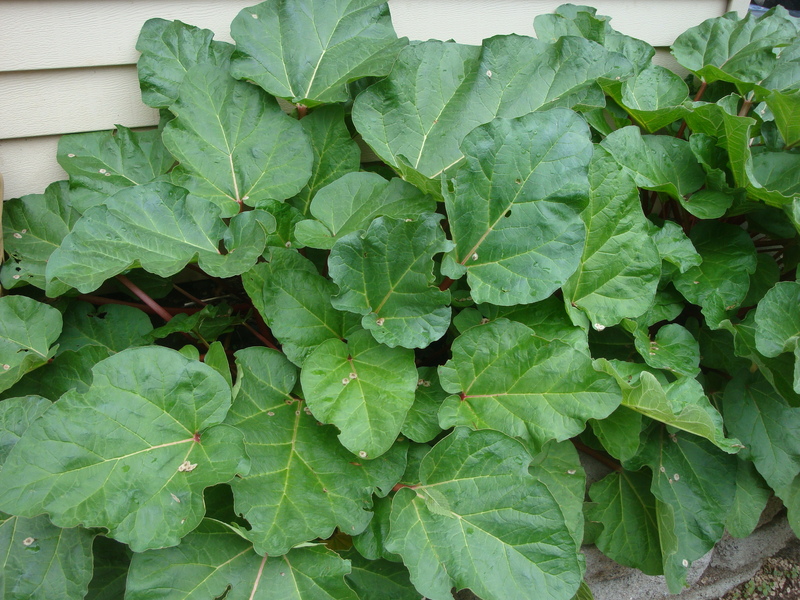 I am lucky to have my pick of their beautiful ruby red rhubarb during the season. Here’s how much we liked it . . . as we were eating the last of it, Randy asked if I would make it again this year. This from a man who did not grow up with rhubarb and isn’t as wild about it as Margaux and I are! 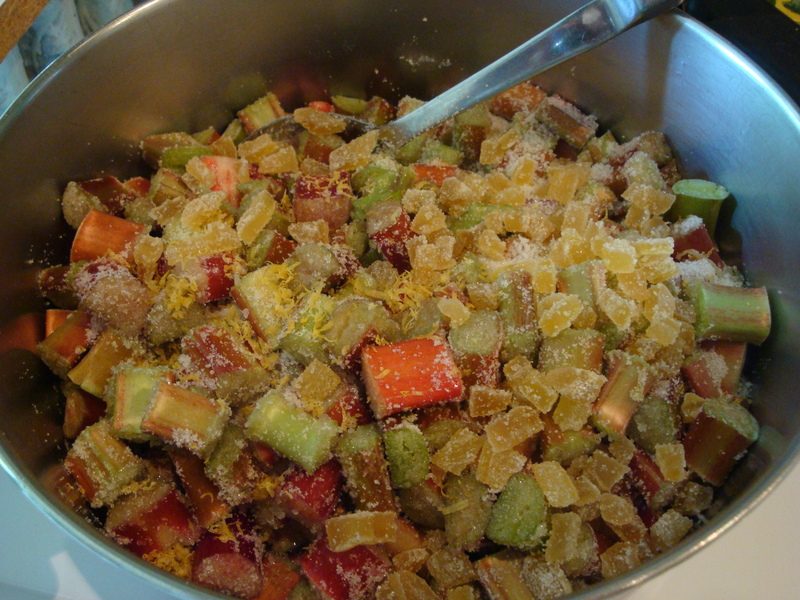 Prepare the rhubarb by combining it with the orange rind and 2 tablespoons of brown sugar in a small bowl; set aside. Prepare the streusel by combining the remaining brown sugar, 1 tablespoon of flour, the cinnamon, 1 1/2 tablespoons of butter, and a pinch of kosher salt in a small bowl. Cut with a fork until crumbly. Stir in the walnuts; set aside. Prepare the cake batter. First place 2 cups of all-purpose flour, baking soda, baking powder, and salt into a bowl. Whisk together to thoroughly blend; set aside. Next, cream 1 stick of butter and the granulated sugar until creamy on high speed with a mixer. Add the eggs, one at a time, beating on high speed and scraping down the sides of the bowl after each addition. Cream for 2-3 minutes, until light and fluffy. Add half of the dry ingredients and mix on low until just combined. Add the yogurt and mix till blended, then the remaining dry ingredients. Beat on low until just incorporated, being careful not to over mix. Place half of the batter in the prepared pan. Sprinkle half of the streusel evenly over the batter in the pan and then dollop the remaining cake batter on top of the streusel. Smooth out with a spatula. Place the remaining streusel on top of the batter. 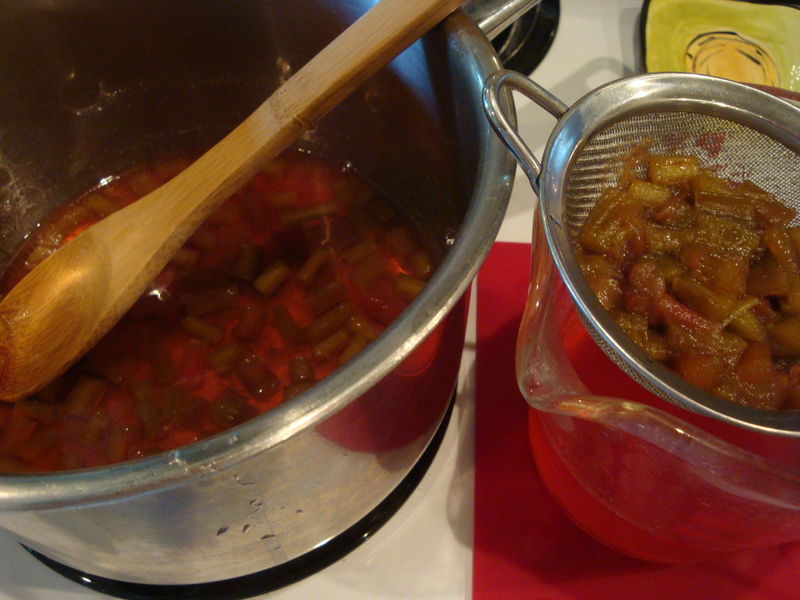 Top all with the rhubarb mixture, being careful to drain of any liquefied sugar. 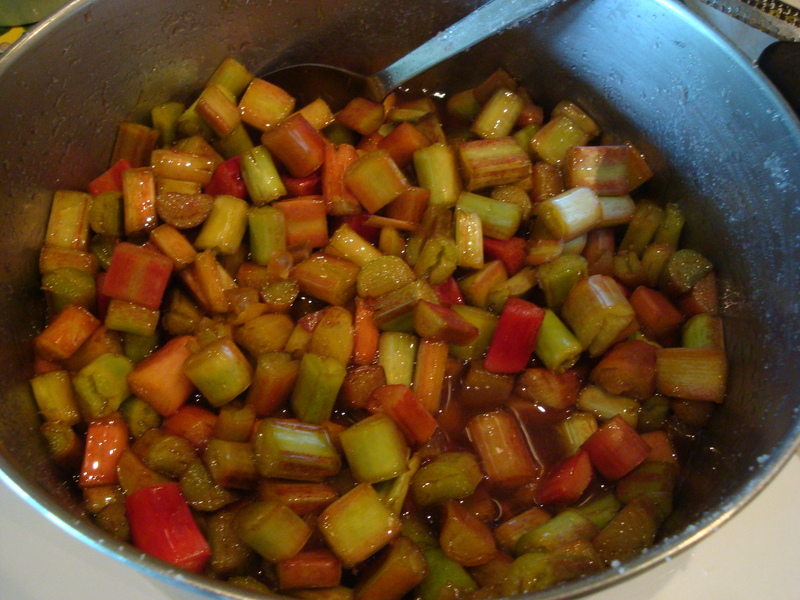 Press the rhubarb down into the batter a little. Place in the oven and bake for about 50-60 minutes. Check the center for doneness with a toothpick at 50 minutes and continue baking according to doneness. Let the cake cool slightly before serving either warm or at room temperature. You can enjoy immediately, and it will last for a few days if stored covered at room temperature. My Mom, a.k.a. Granny, is a great pie baker of the traditional persuasion. What I mean is that she had a few basic pie recipes – nothing fancy – that she was well known for because they were so outstanding. Growing up I didn’t appreciate this because I definitely liked cake better than pie. If I did like pie, it was the cream or custard variety where I’d eat the filling out and leave the crust. Now it’s the opposite! I prefer pie, love the crust and fruit filling trumps cream/custard. 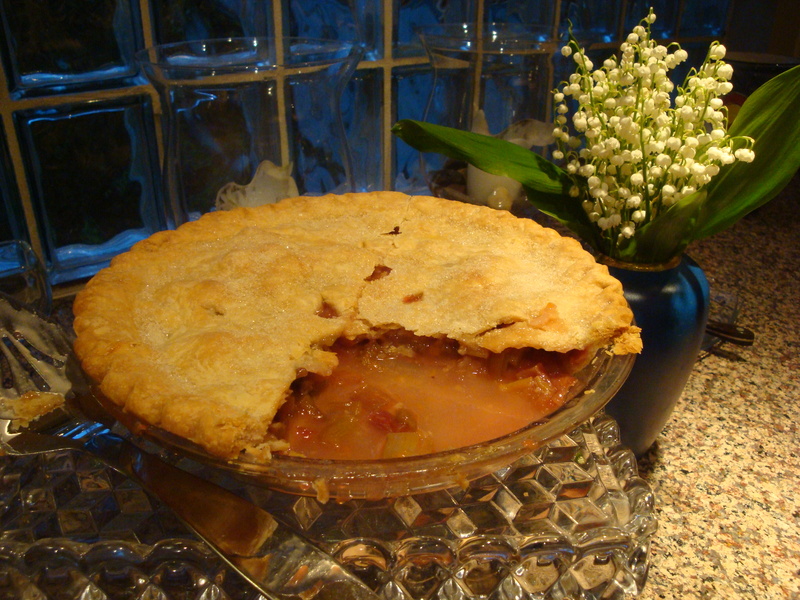 When rhubarb season rolls around it heralds the fruit pie-baking season for me. 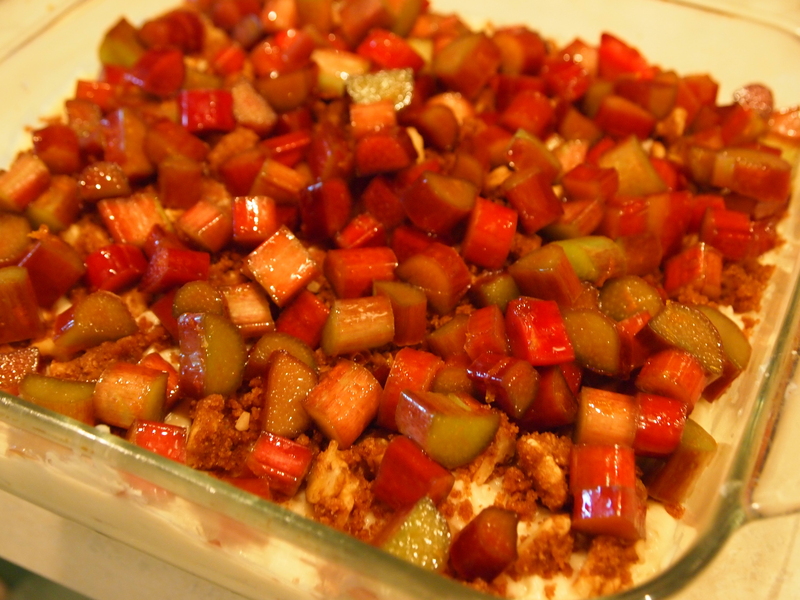 Last year, we posted all kinds of fancy rhubarb dessert recipes. Time to appreciate the basic approach of this timeless and classic rhubarb pie. This is one of my favorite pies! I don’t think I’ve ever actually made it, but mainly because I haven’t needed to…you can usually bet that there will be one of these at my Dad’s house this time of year, and more than once, sort of like apple pie in the fall. So if I get a craving, I can just invite myself to dinner. But I completely agree with Aunt Suzy…sometimes a basic, classic pie just totally hits the spot. And this one fits the bill! This recipe is geared to a 9-inch pie plate. Adjust quantities up or down for other sizes. Line the oven bottom with foil and preheat to 425°. 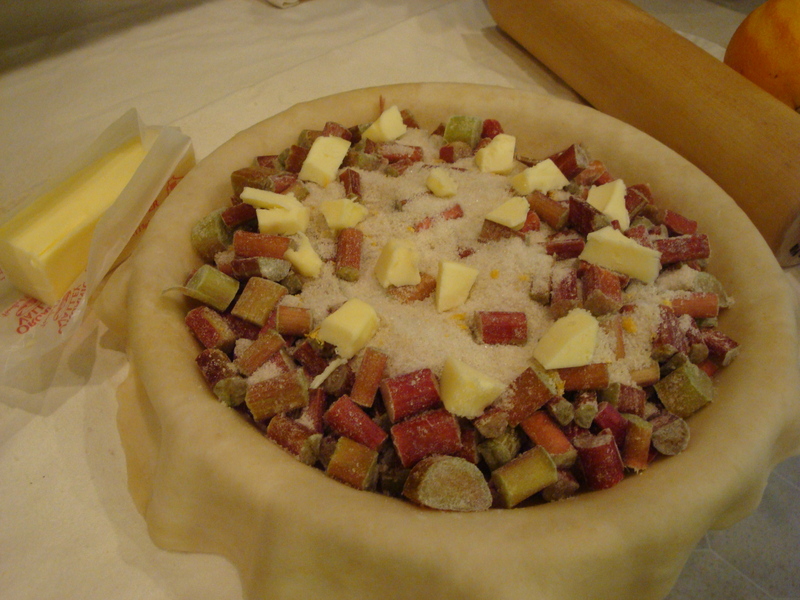 NOTE ON THE AMOUNT OF SUGAR: We like our rhubarb pies on the tart side, adding less sugar to the filling and then sugaring the top crust. You will want to add a little more sugar to the filling if you like things on the sweeter side. Place the top crust over the filling. Crimp the edges and then cut slits in the top crust. If you want to get fancy, you can cut a beautiful pattern into it. Margaux’s other Grandma had a lovely traditional family pattern that she used. My Mom took a more practical approach, cutting a few slits to make sure the steam escaped. Sprinkle sugar over the top crust. Place the pie in the pre-heated oven. Bake at 425° for 15 minutes, then turn the heat down to 350° and bake for another 30-45 minutes until done. (Electric ovens seem to finish closer 30 minutes, gas ovens take longer. Start checking after 30 min.) Don’t forget to turn the heat down after the 15 minutes! 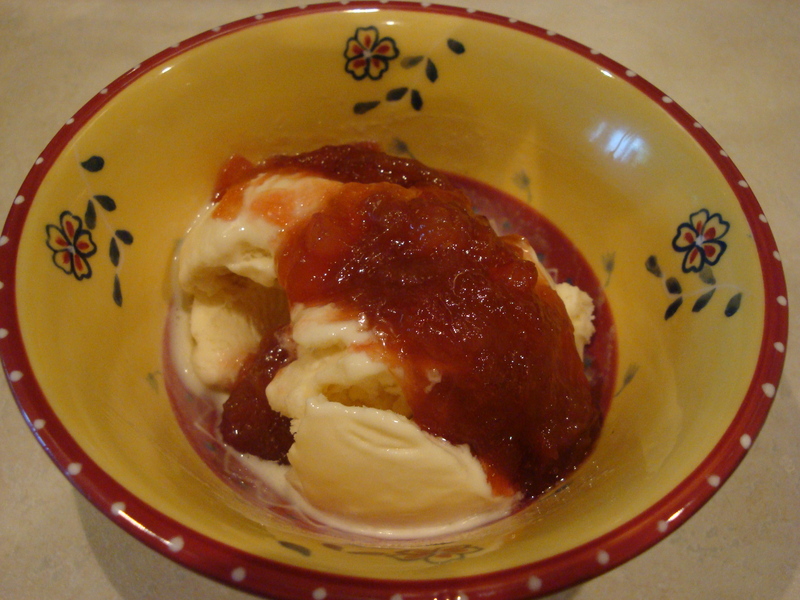 Enjoy warm or room temperature, plain or with a scoop of vanilla ice cream. And don’t forget to leave some for breakfast (of champions)! 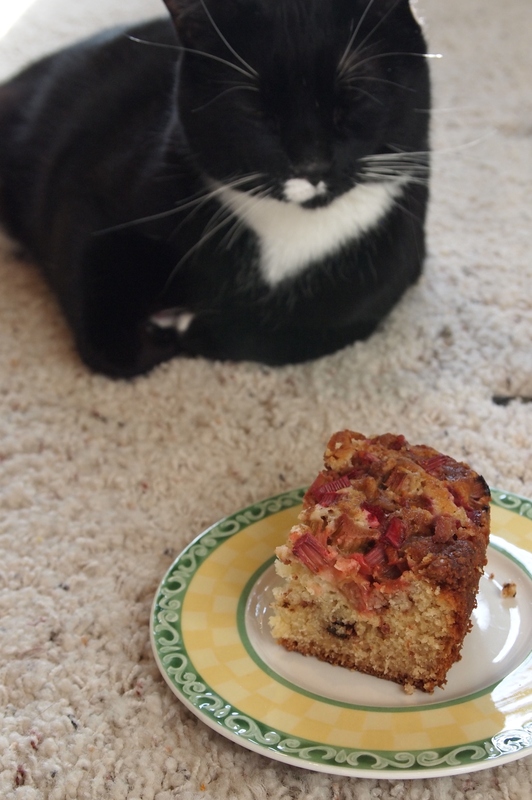 It’s rhubarb season and time to get busy! This recipe comes via my friend, Sue, who got it from her cousin, Madelyn, also a friend. 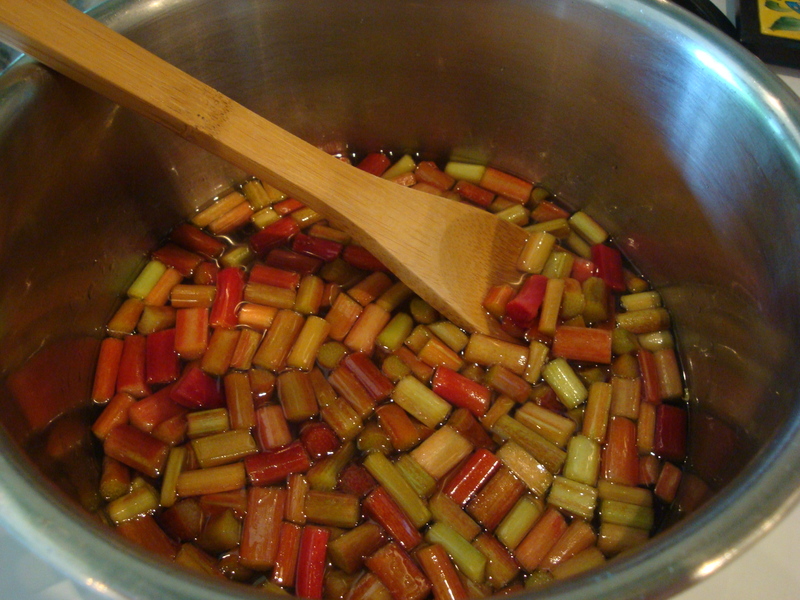 I’ve never made rhubarb jam or sauce, preferring to go straight to desserts. I’m glad I made it and am on my second batch – it’s fun to give to friends. 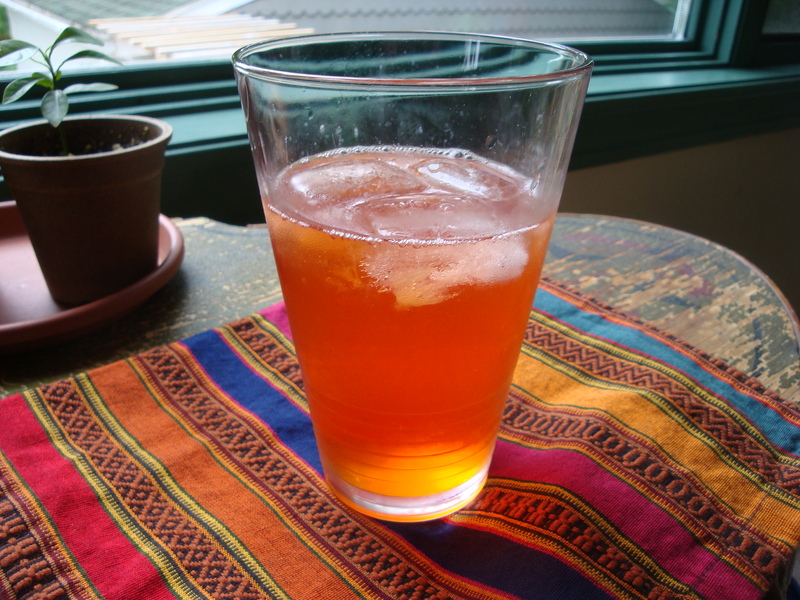 From search results, I saw several recipes that used fresh ginger and think I will try that next. I also learned this recipe was published in the Washington Post in May of 2007, which acknowledged it came from Bon Appetit. 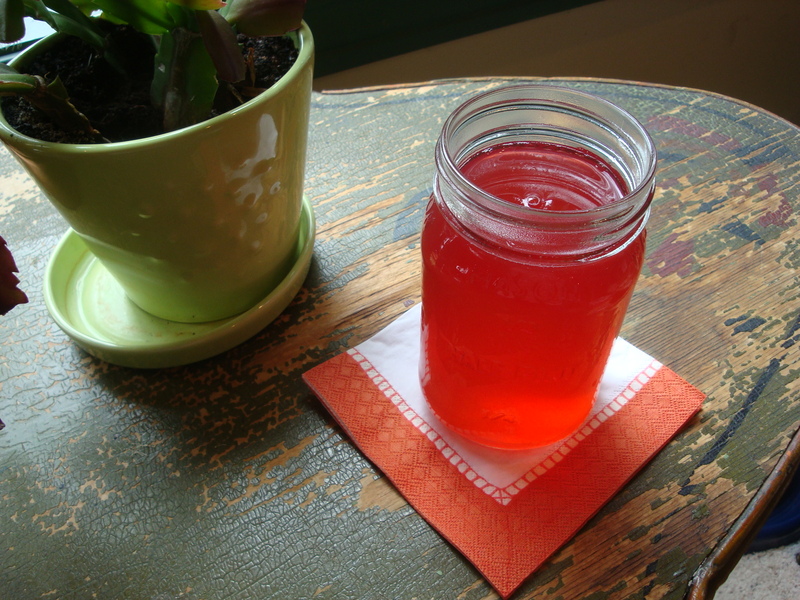 The jam can be stored in the refrigerator without having to go through a canning process. Place all ingredients in a large pan or Dutch oven. Stir to combine and then place over medium heat, stirring constantly (so it won’t burn) until the sugar melts. This takes 10 minutes or so and requires some muscle – I thought it would never melt! 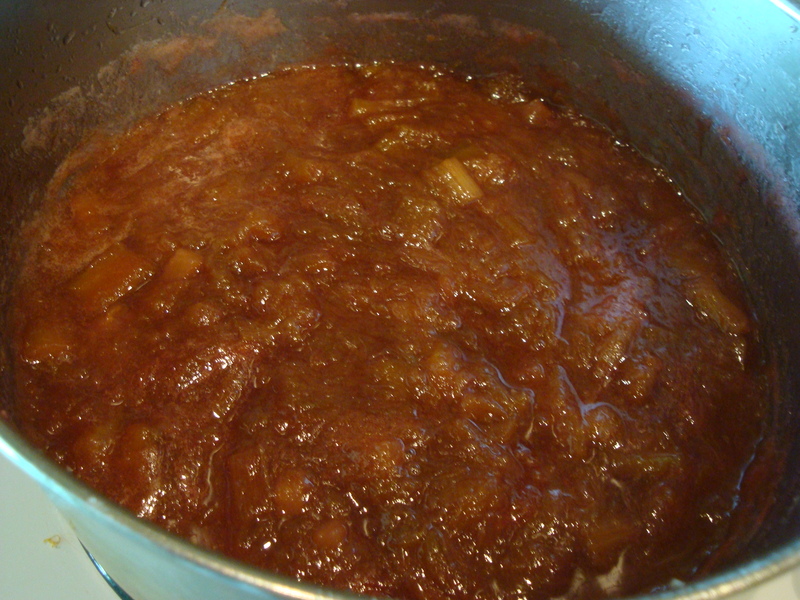 Once the sugar is melted, turn the heat up to medium-high and bring to a boil, stirring constantly. Turn heat down to medium-low and cook uncovered, stirring occasionally, at a good bubble until thickened. The recipe said it could take from 20-40 minutes to get to the desired thickness. I cooked both batches for 20-25 minutes and was pleased with the results. I think there’s a caution about cooking it down too much because it thickens somewhat after taking it off the heat. Cool to room temperature, although if you’ve got some vanilla ice cream on hand, scoop some out and put the jam on it while still warm! 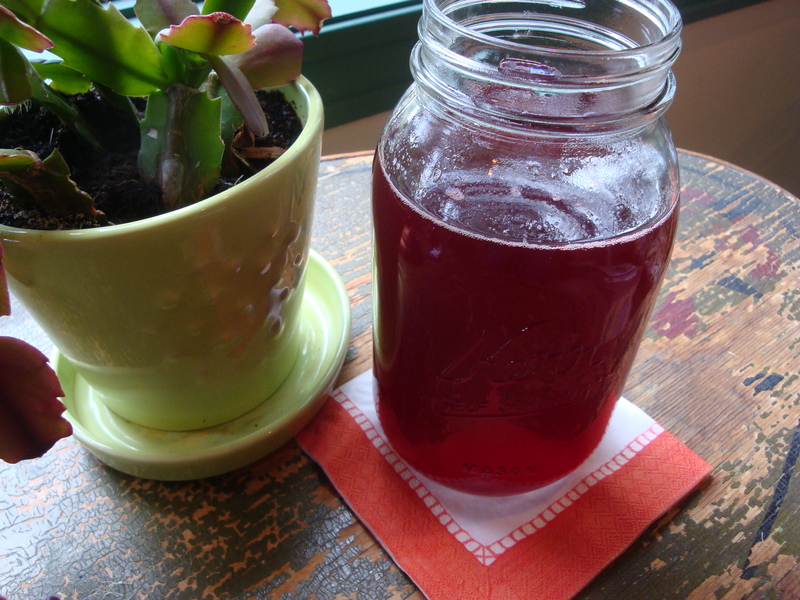 Once cooled, place in jelly jars. Refrigerate. Alternatively you can seal the jars by placing the jam in the jars while hot. Place the lid on the jar and turn upside down to create a vacuum. 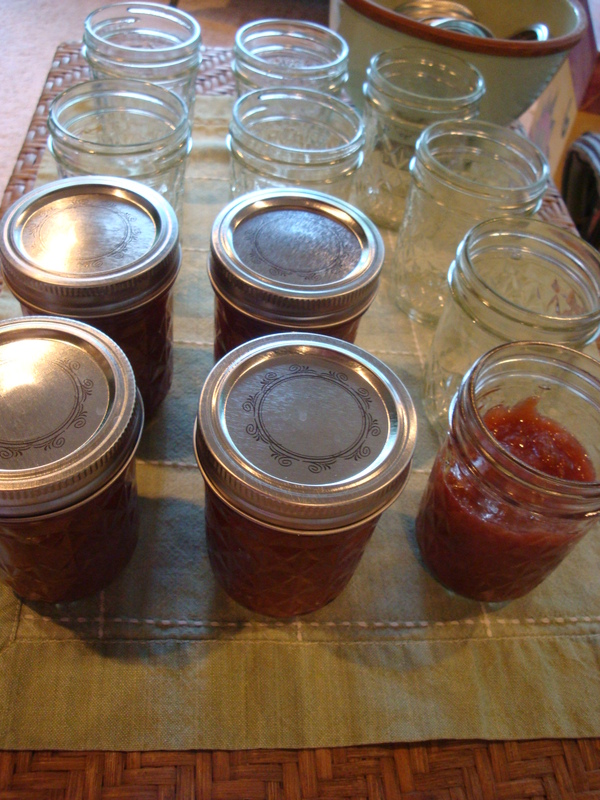 After 15-30 minutes, turn the jars upright to seal the lid. Refrigerate after opening. The quantities in this recipe made a little under 5 cups of finished product. I’ve had it on said ice cream and on toast, but I bet it would be good mixed with plain yogurt or served on pound cake. Wouldn’t you know it?! 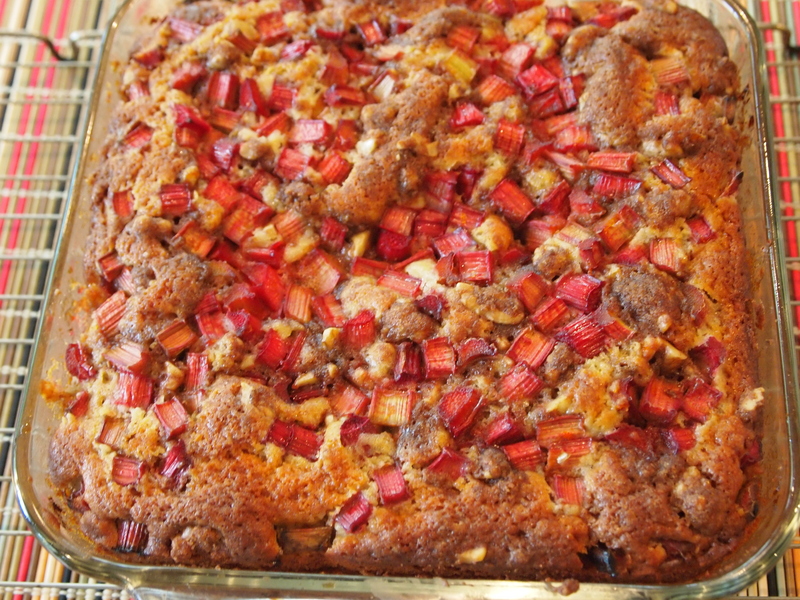 After stating my purist approach to rhubarb desserts in a previous post – no strawberries please – this recipe caught my eye. I made it for my book club gathering last Friday and the entire time I was making it, I had my doubts. 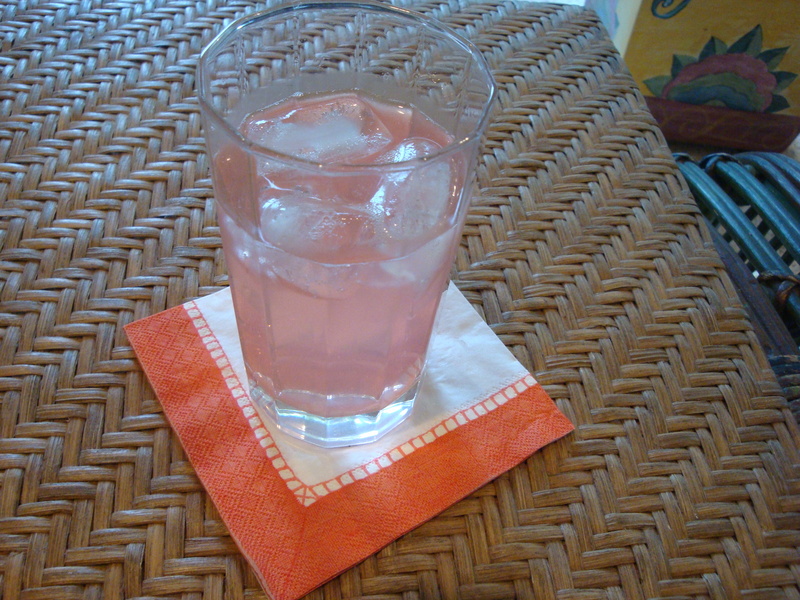 The biggest doubt, besides the adulteration of the rhubarb with strawberries, was about the vanilla. I had never seen a rhubarb recipe using vanilla. Cinnamon? Yes! Orange zest and juice? Yes! But never vanilla. However . . . I am glad that I persevered because this dessert is really tasty. 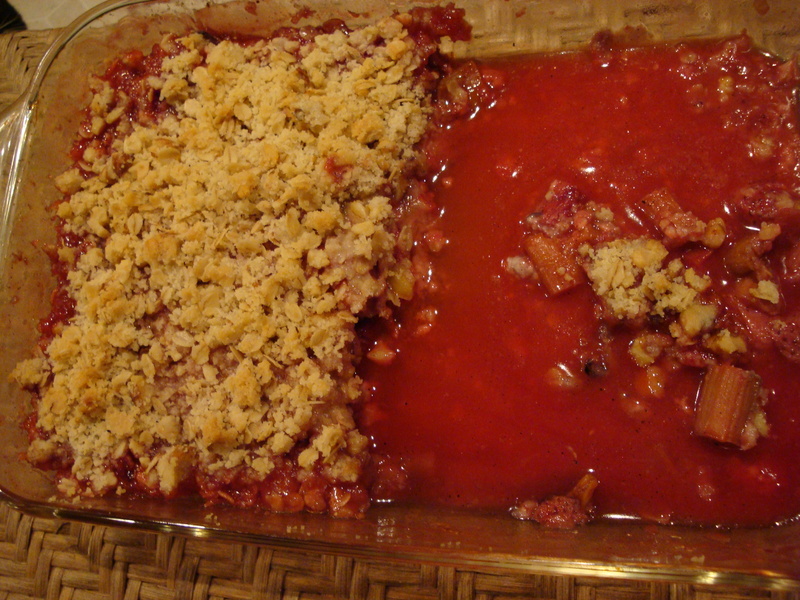 So whether you are a rhubarb purist or you already like strawberry-rhubarb desserts, I recommend you give this a whirl. Strawberries are at peak right now, at least in the Midwest, and rhubarb is plentiful. A note about the name and ingredients: The original recipe in Bon Appetit said that “crumble” is the British word for desserts we call “crisp”. 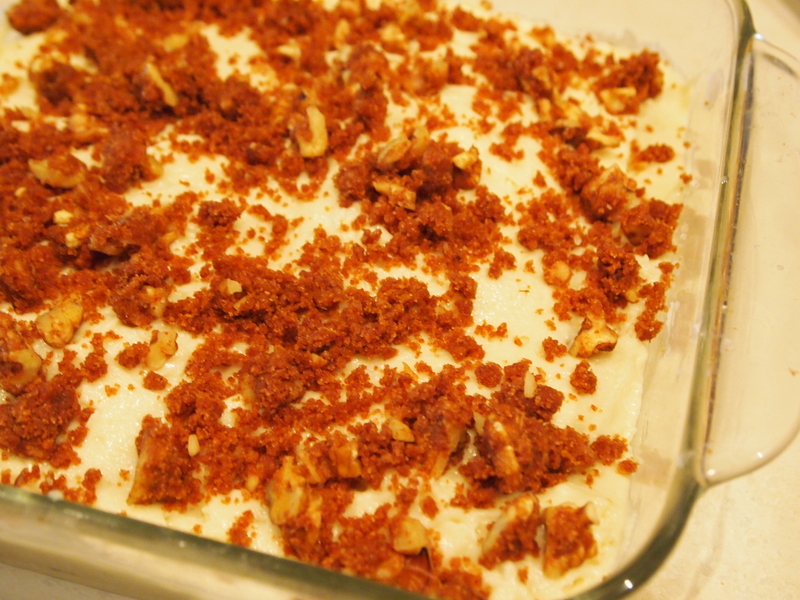 It also called for hazelnuts, which I don’t particularly like, so I substituted walnuts. I might try it in the future with the hazelnuts, but since I was making it for the first time for company, I felt walnuts were a safer bet. If you don’t have whole vanilla beans handy, you could add vanilla extract. I believe for this recipe to truly be smashing, it needs local, in-season strawberries. Lastly, I am so happy to have my Hanson Brothers 25lb antique scale when something calls for ingredients in ounces! I’m not sure of the exact date of manufacture, but it was made in Chicago, IL sometime after 1898 when the company was founded and probably before 1940. Even though it’s old, it lives up to their promise of “honest spring scales”! Combine flour, 2/3 cup sugar, and salt in medium bowl; whisk to blend. Add butter. I used a technique for adding butter that Randy taught me. 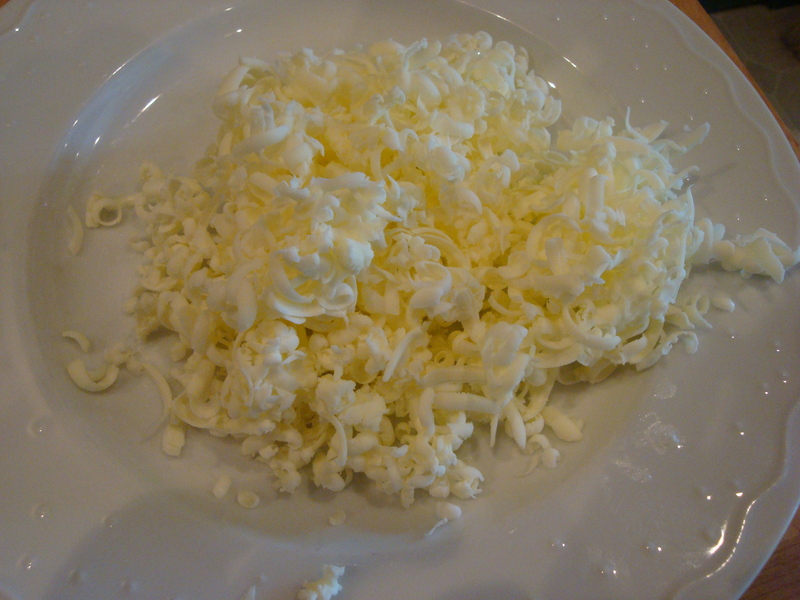 Freeze the butter and grate, then add to the dry ingredients. Rub in with fingertips until mixture sticks together in clumps. Mix in oats and nuts. Preheat oven to 375°F. Butter 11x7x2-inch glass baking dish. Place 1/2 cup sugar in a small bowl and scrape in seeds from vanilla bean; whisk to blend well. Add sugar to strawberries and rhubarb in a large bowl; toss to coat well. 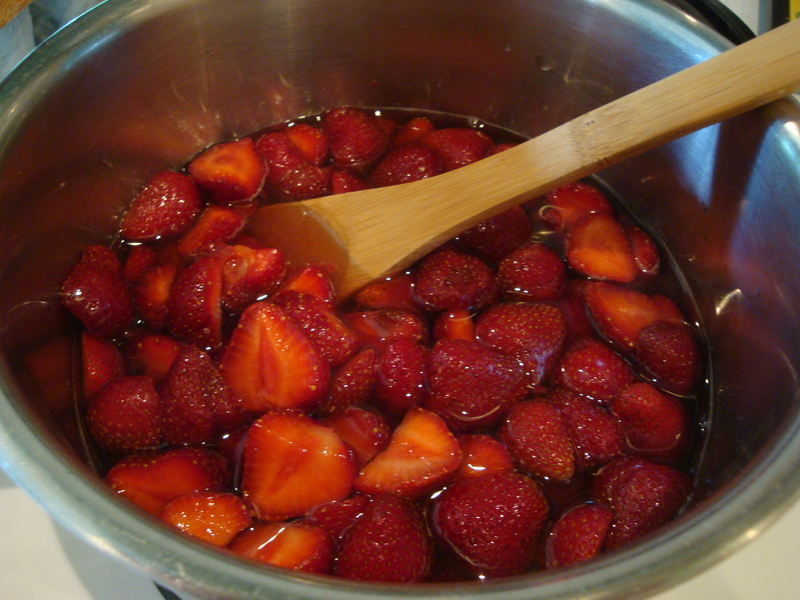 If using vanilla extract, add to fruit and sugar mixture after the sugar has been added. Stir well to distribute. 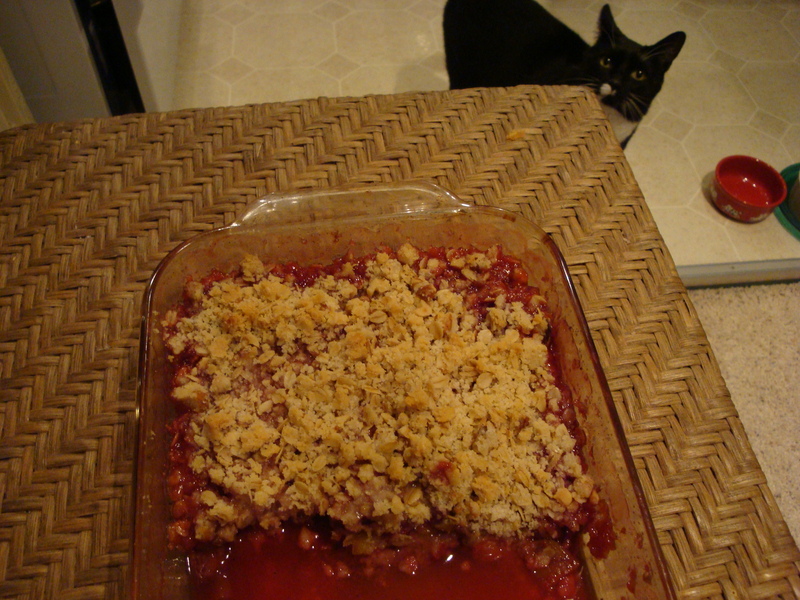 Are we rhubarb crazy? Yes!!!!!! Randy and I got together with friends Al and Sue Eklund Sunday for a holiday celebration and to play Sequence. We’ve determined this is our summer game of choice which we play on their great screened-in porch. (We play Oh, Hell for some reason in the winter only.) 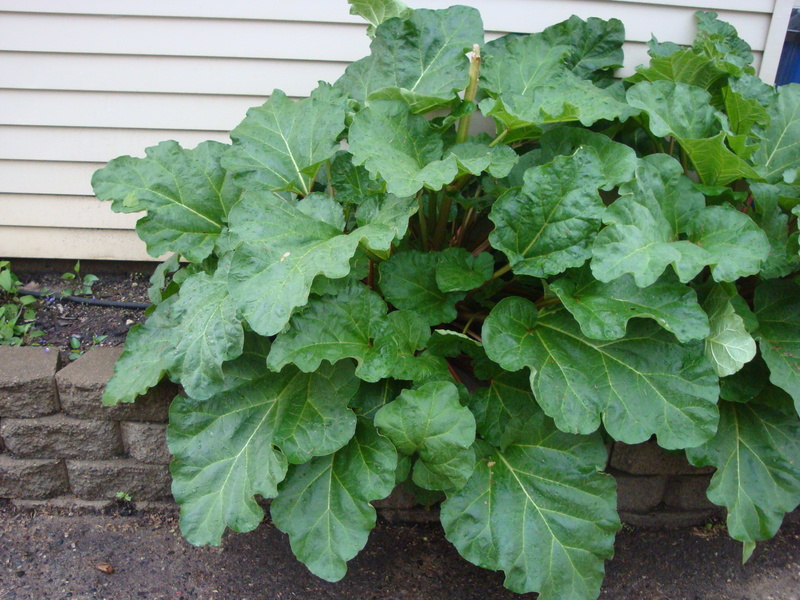 The Eklunds have a beautiful rhubarb patch at the bottom of the hill in their garden, along with several peony bushes. 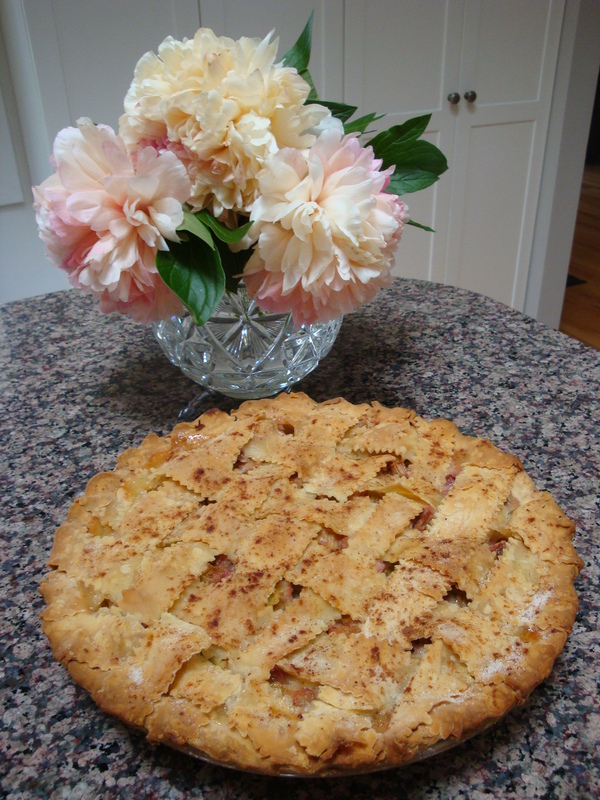 Sue made this custard version of rhubarb pie, which ran in our paper in May of 2007. From the article: “Midwesterners love their rhubarb pie straight up (strawberries are better left for shortcake), and if you try this recipe, we think you’ll agree.” We thought it was delicious! 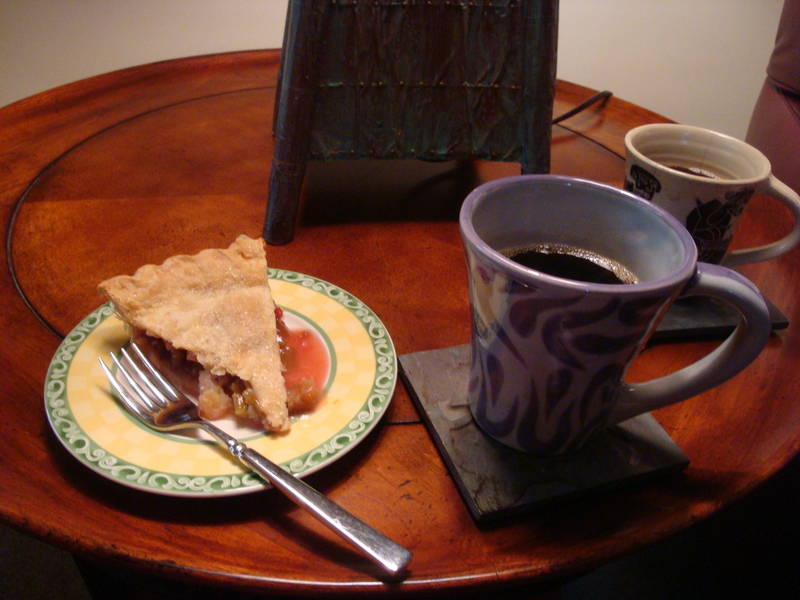 Do you agree with the sentiment about straight up rhubarb pie or do you prefer yours with strawberries? Preheat the oven to 400 degrees F. Combine the sugar, flour, cinnamon, nutmeg and salt in a large bowl. 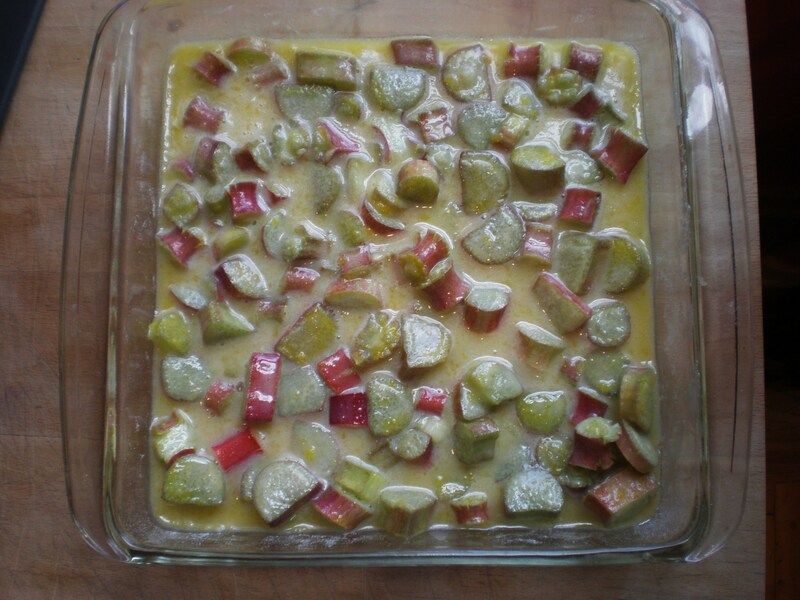 Add the eggs and rhubarb, tossing to coat. Pour all into a 9-inch shallow pie plate, lined with the bottom crust of the pastry. Dot with the butter and top with a lattice crust, which you can learn how to do with this video if you’ve never made one. (like me!) Bake for 50-60 minutes, until filling bubbles and crust is golden brown. 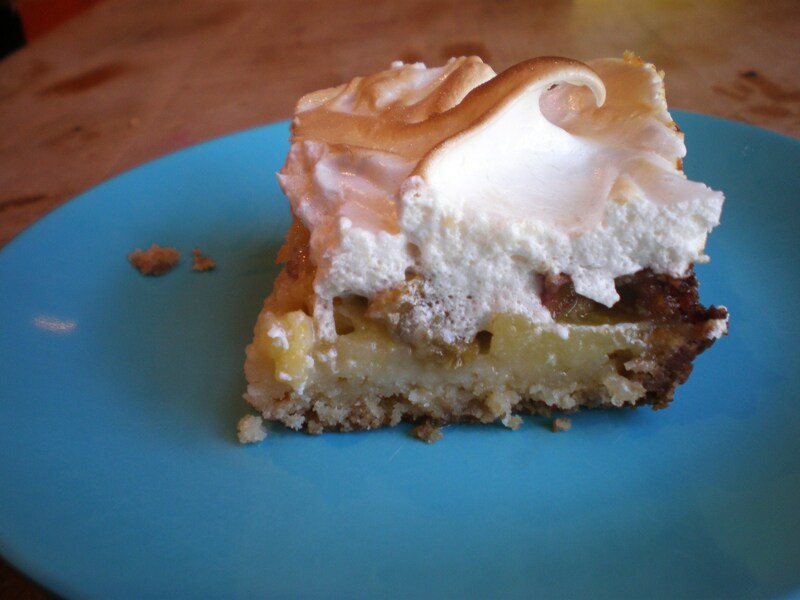 I asked my friend Sue to share her thoughts and tips about making this pie. 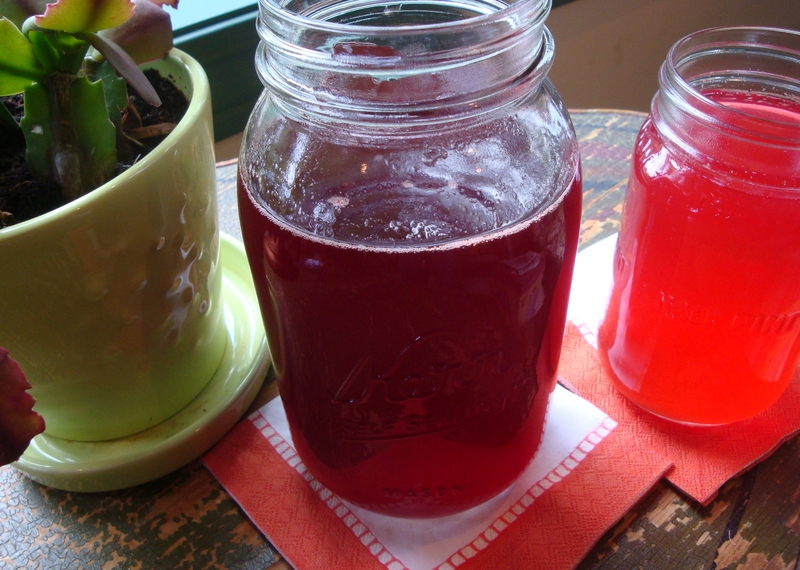 I’ll take my rhubarb straight up – no strawberries! I substituted Pappy’s frozen crusts for “real” crusts made from scratch. Cal Garner ( my dad/chef) used to say they are “almost” as good as scratch! And they save time. 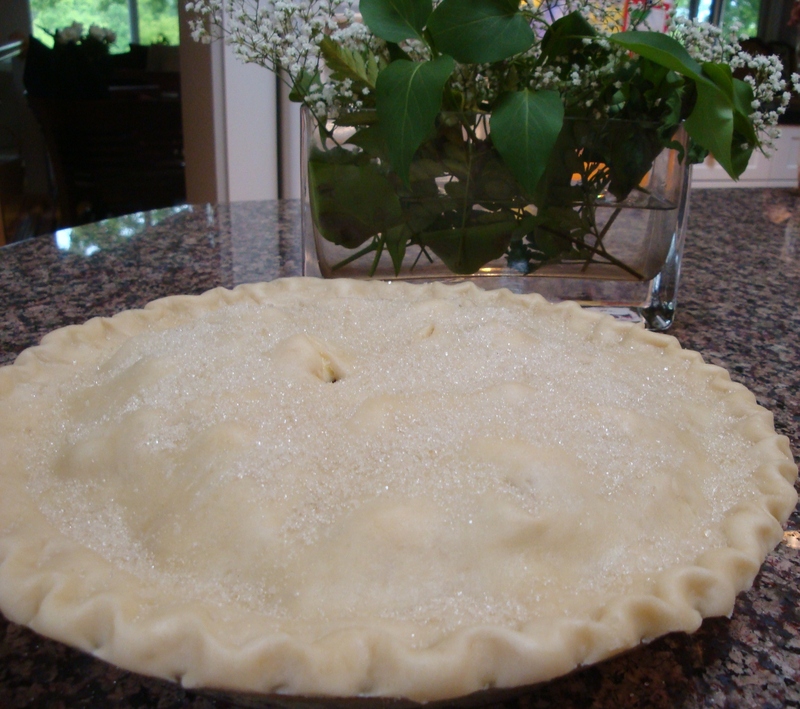 I sprinkled sugar and cinnamon on the crust before baking and used pie crust shielding strips to protect the edges. I did a half recipe…this is a lot of torte if you’re not having a party! I used an 8×8 glass baking dish. 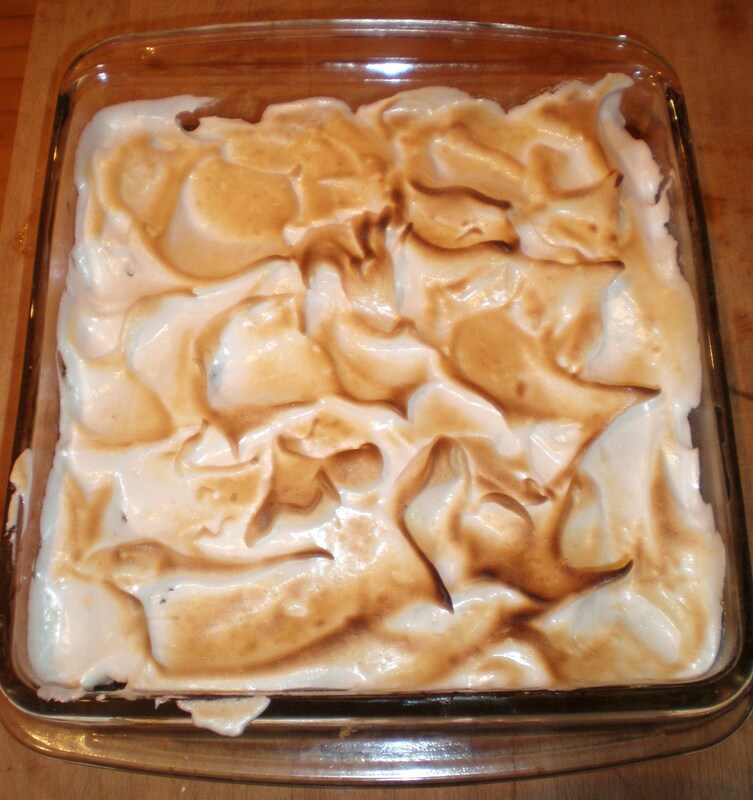 Also, I did a different method on the meringue: I cooked it in a double boiler to 160 degrees, constantly stirring, then put it in the mixer and beat it on high until medium peaks formed. Then I spread it on the torte and put it under the broiler on high for about 30-40 seconds, just to brown the tips. I always feel like the meringue is slimy on the bottom, and dry on the top. This method ensures that your meringue will be uniformly fluffy all the way through! Heat oven to 350°. You will use an ungreased 10×14 baking pan. Mix flour and powdered sugar. Cut in butter. Pat evenly onto bottom of the pan. Bake 10 minutes until golden brown around edges. Mix remaining ingredients and pour over baked crust. Bake 1 hour. Top with meringue while the filling is still warm. Beat egg whites on high speed till soft peaks form. Add sugar a little at a time until stiff peaks form. Add vanilla. Spread over torte and bake a few minutes until peaks are golden.